The August 2017 eclipse of the sun did not arrive without all the myth and superstition that surrounds this cosmic event, and was seen by many as an omen and possibly a prelude of ominous things to come. Ancient cultures and inhabitants of many different lands had their own explanations for the sun disappearing in the sky. From demons, dragons, bears, and wolves devouring the great fire ball, and even anger of the gods; and most feared the eclipse was a sign of disasters and earth shattering events to follow. The Native American Inuit tribe believed the sun and moon fought, and the sun left for a period of time to recover and then returned. Much of this was cultural folklore and may seem to us to be rather naïve, even comical in terms of the modern world of today. But for the record, and to ease the minds of the hysterical waiting for doomsday, science has debunked any claims that an eclipse has an effect on people, health, and the environment. Perhaps the ancient world, with all its legend, myth, and superstition, was not so backward, so to speak, in how they viewed life and the natural order of things. For instance, there has been talk of the end of days since time immemorial. Following the eclipse, inclement weather during hurricane season, and other world events and natural disasters, have caused the timid and those who live their lives in constant fear to think that the sky is about to fall. They rely on the media, politicians with an agenda, and the experts all in a tizzy over “climate change,” and wind and rain and people abandoning their homes fleeing to safety. This has occurred many times over the years, and aside from what you may have heard back then, hurricanes Harvey and Irma and Maria were not the biggest hurricanes ever recorded. Now when you consider the path that humanity is travelling today, I guess the thought of the “End of Days” is not that farfetched and only out of the mind of a zealot, religious or otherwise. In the New Testament Book of Revelation there can be found the Four Horsemen of the Apocalypse who represent Pestilence, War, Famine, and Death, and are released upon an ignoble world as a harbinger of what is to come, Judgment Day. And for many the eclipse was the event that preceded the inevitable, and was the opening salvo for what was to follow. The Bible, the Horsemen, the weather, and other world events and natural disasters can lead some to have apocalyptic visions and believe we might be on the verge of facing the eternal. And this talk today of the End of Days has come about because there is in fact great unrest throughout America and the world. There are places where disease, hunger, internal strife, and death are a daily part of life. When we think of the meaning of the Apocalypse, we envision death and destruction. I believe if there is anything that would cause the Almighty to release the forces of doom on mankind, it is how over the last 44 years we in this country and the world have released a plague, an apocalypse, and waged a war on innocent lives that has caused the death of over 60 million and 1.4 billion respectively through the horror of abortion. The failure to recently pass the Pain-Capable Unborn Child Protection Act in the Senate, at the hands of Democrats, to me was a sin of incalculable measure. There is a passage in Proverbs (6:16, 17) that says: “Hands that shed innocent blood are detestable to God.” You want a reason for His wrath and the end of things, this is it. Let’s take this one step further; it occurred to me that if a picture is worth a thousand words, just maybe numbers could paint a picture worth a thousand, perhaps a million lives, if presented in an unadulterated manner free from any extraneous influences, and for the eye to see and mind to absorb. Numbers are unique and part of a set of what are termed as positive integers. Where would we be without numbers; mathematics, the sciences, economics, computers, but more to the point, when we think of numbers it’s usually associated with counting or figuring out something to achieve an end result, such as balancing a checkbook, adding up expenses, completing taxes, how much something costs, how many candles on a birthday cake, timing an event, measuring a distance, dialing a phone number, and how to find someone's house number - I could go on and on. There can be occasions, however, when the visible representation of some fact or truth represented by a number or numbers can have a tremendous impact both physically and emotionally, such as when a catastrophe strikes, you read or hear about the harrowing event and wait for the number of people injured or killed to be made known. This brings us again to the subject of abortion and your reaction when it is raised. The constant refrain usually goes something like this, you're killing the most innocent of life in the womb, denying a baby’s right to be born vs. a woman’s right to choose and use her body as she sees fit. But perhaps what is needed is a stark and unencumbered dose of reality, that the many abortion supporters, if they have the courage, could see for themselves through a numerical count that is constantly changing by the second, innocent life as it is terminated across the planet. 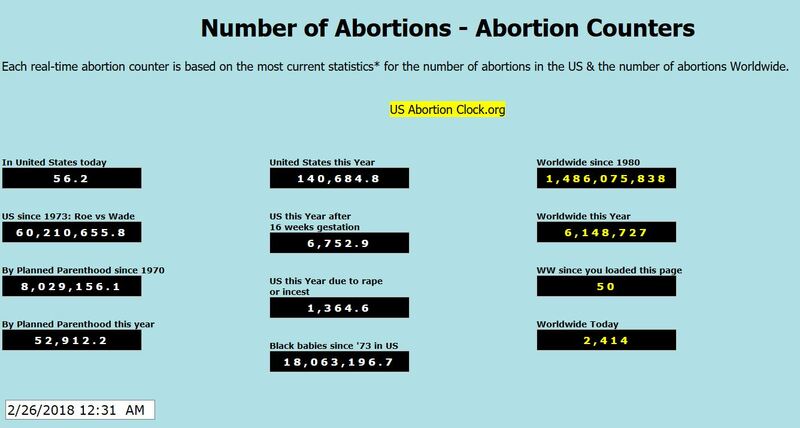 With this in mind, if you go to the US AbortionCounter.org, which all of us, especially supporters of abortion, should do, you can sit at your computer and watch as the numbers change and increase, knowing from moment to moment, another innocent life somewhere is being terminated. Perhaps this will act as a stark dose of reality, before your very eyes, a death toll by the second and the numbers.